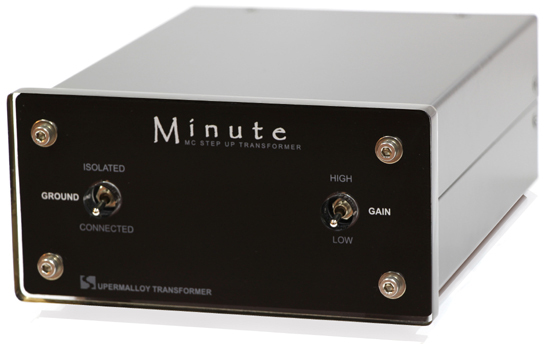 New 2014 Minute casing design for completely built SILK Supermalloy step-up transformer. First experimenting in the year 2005 and introduced in the year 2006 with MC-220 model, we have only made one technical change in the year 2009 with "A" type Ultra Permability Core material upgrade specially made to improve the induction performance by 50% from the first version. Although we try to improve all of our transformers by virtually every espect of material, design or making, we have yet to find any better combination than our original design. SILK MC-220A is by far one of the longest production we are so proud of. Although there are several good MM phono cartridges, or MC high output phono cartridges on the market, there is no real substitution for playing LP with true MC type Phono cartridges. The superiority of MC cartridge over MM cartridge is obvious. 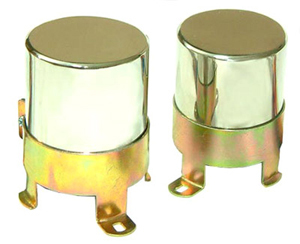 MC phono cartridge usually has very small copper turn on its armature coil as compare to MM cartridge thus it has very low moving mass, low output impedance (usually under 50 ohm) and low output signal (usually under 0.3mV) resulting in better bandwidth and retrieve better resolution out of vinyl groove than MM cartridge. 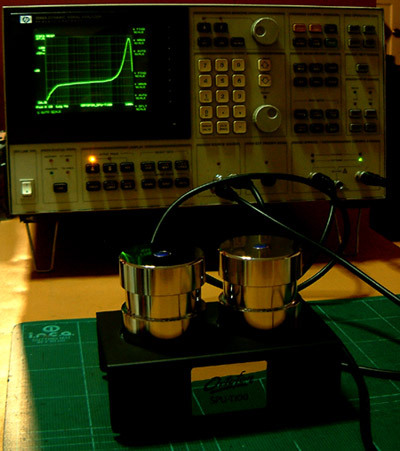 (1) Active amplification can be done by using active electronic components like IC, Opamp, Transistor or Vacuum Tube. 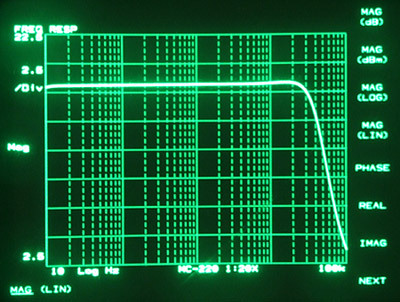 This amplification usually encounters noise and distortion problem since the signal level is very small (usually under 0.3mV) to the point of inherit noise floor of most active components; therefore, the active (Head-Amp) amplifier mostly utilizes high degree of negative feedback in the circuit to minimize noise and reduce distortion. This seems straight forward but there is another amplification methode (Passive) that is more simple and yield better linearity. (2) Passive amplification can be better alternative to work at low signal level (Step-Up Transformer) since it inserts almost zero distortion, or noise to the signal. Basic principle of Step up transformer consists of two independent coils with different in copper turns. The differences can be defined as ratio and if the ratio is step up (eg. 1:10) amplification is obtained through the mechanism of magnetic coupling. Step-Up transformer is passive, so it offers linear property without any help of negative feedback so purer signal transfer is realized. But not all MC-step up transformers are the same! SILK Supermalloy MC-Step up Transformer is taken several steps to design and build better transformer to bring the great property of Passive amplification to the extreme. Starting with the heart of the transformer, that’s the core material, we use the best Supermalloy Nickel/Cobalt alloy core in the world to provide the highest inductance with lowest copper turn to allow extreme Nono Winding Technology that extend the frequency bandwidth with lowest phase shift and highest signal transfer. Nano Winding Technology is implemented. It is our exclusive technique developed in our own workshop that comprises of super small OFC wires (much smaller than human hair) bundle together to extend high frequency by increase the skin area of conductor(skin effect). The copper wire is also wound in perfect layer throughout the coil to help maximize signal integrity. Our design is also aim to reduce cartridge distortion by providing theoretical loading (true loading) down to 20Hz when most other MC transformers neglect this. Our Lab test has proved that although most signal information on LP are consist of mid-high frequency due to RIAA standard, ample loading MC-step-up transformer with true loading down to 20Hz helps lowering distortion on cartridge throughout audio band. While we offer SILK MC Step-up transformer in 5 standard models each with different step-up ratio and loading impedance to best suit for most MC cartridges on the market, we also offer custom winding to match specifically each MC cartridge to selected Phono stage pre-amplifier. Unlike other component, different MC cartridge has very different parameter and specification; therefore, requirement to have a matched MC-step-up transformer is absolute important to ensure maximum performance and sound. Think of MC cartridge as a woofer driver and MC step-up transformer as enclosure, it would be impossible to determine a single best enclosure for every 8 inches woofer since each 8 inches woofer on the market has such big variety on its own specification. Our custom winding program can ensure matching on load impedance and step up ratio to your MC cartridge. Please contact us to determine what is the best solution for your application. SILK MC-220A is very versatile model. It can be connected in two ratio. With 1:10X step up, it will have 100 ohm load. With 1:20X step up, it will have 25 ohm load. These two connections can cover the need of 90% of all MC cartridges on the market; however, in case that special requirement is needed, we are happy to do custom winding to exactly match your cartridge requirement. Figure 1. 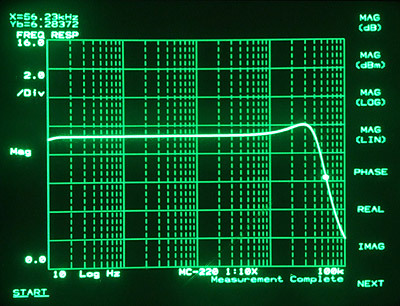 Shows MC-220A (1:20X) frequency characteristic with 12K load. Linear response is from 10Hz to over 25KHz within 0.1dB While -3.0dB point is extended beyond 40KHz. Figure 2. shows MC-220A with 1:20X ratio both frequency response and phase response. 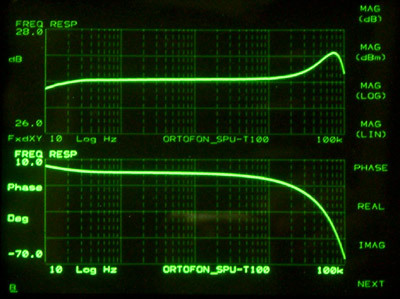 Top trace is for frequency response while bottom trace is for phase response. It is evident that the phase is very linear and has smooth transition with no peak or dip. Figure 3. show MC-220A with 1:10X step up ratio to 12K load. Its frequency response is linear from 10Hz to around 20KHz with small boosting after 20KHz and smoothly drop down to -3.0dB at around 56KHz. This is surprising for most Audiophile but if we compare our SILK MC-220 to other MC step up transformer, the boosting in high frequency of other step-up transformers are much more severe as depicted in figure 6. 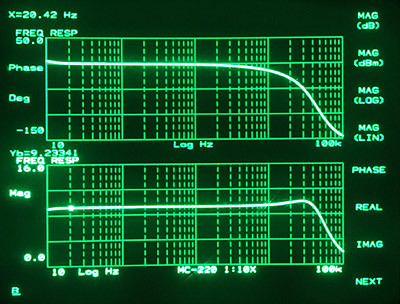 Figure 4. shows MC-220A with 1:10X step-up ratio frequency VS phase response. 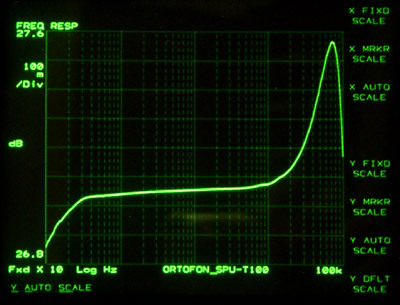 Top trace is phase response which is very smooth without any peak/dip. Lower trace is frequency response. Figure 5. shows one good example of other MC-step up transformer (SPU T-100). 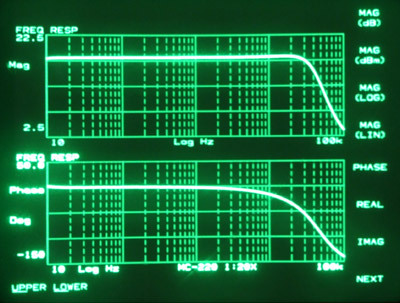 The low frequency is droping due to its low inductance and the high frequency is boosting from 10KHz up to around 80KHz. 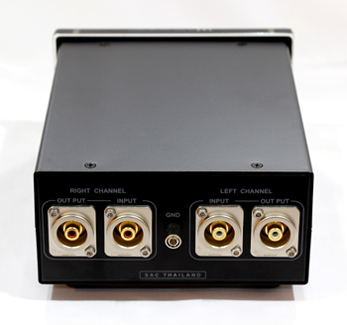 This big resonant can cause big audible effect and high degree of HF distortion. Figure 6. shows the frequency response curve for other MC step up transformer. Low frequency is impaired due to the lack of appropriate loading. High frequency resonant is very severe causing big treble boosting. 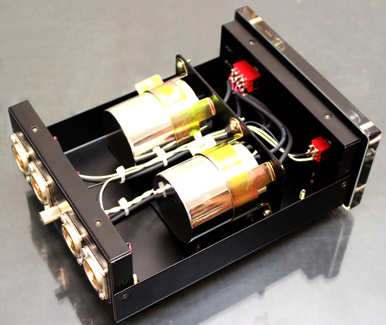 This ultra sonic can create noises to most phono stage causing undesirable effect. Figure 7. shows actual test and result done with other MC step up transformer. 1:20X with fixed 100 ohm loading impedance. Suite well with cartridge that has 20-50 ohm internal impedance and 0.2-0.4mV output level.